These products are flexible to meet the needs of any lab. Gain the peace of mind that comes from knowing your lab is free of contaminators. 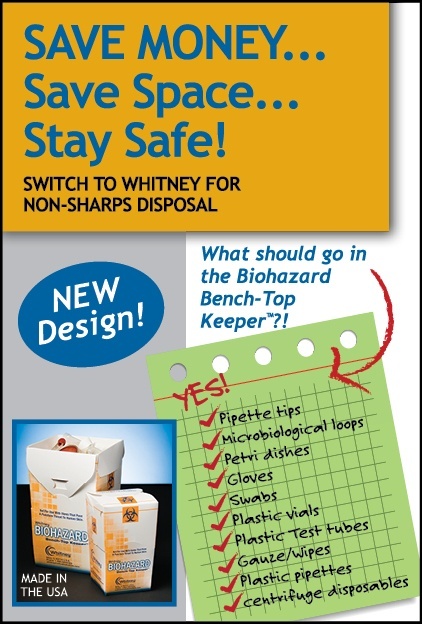 We have a solution to that problem - The Whitney Medical Solutions’ Biohazard Keepers! Feel confident that you’re reducing contaminants each time you dispose of a Biohazard Keeper™ full of biohazardous waste. With each new Keeper you’re ensuring you workspace is contaminant free. Broken Glass Keepers come in both Bench-Top and Floor models and offer a solution to the handling of non-contaminated broken glass. Prominently marked with broken glass symbols, these containers heighten the awareness of the dangers of broken glass and help reduce the incidence of injury by keeping glass isolated from non-sharp waste. All containers ship and store flat, conserving valuable storage space and assemble easily in seconds.